From john F. Blair Publishers. Available in hardcover and e-book editions. Cooper Lanier has been elected Governor of her southern state, succeeding her husband, Pickett, who is running for President. Pickett intends for her to simply be his stand-in while he manages affairs back home from the campaign trail. But Cooper – smart, feisty, independent -– has her own ideas. She struggles to chart her own course through the treacherous shoals of male-dominated politics, finding unexpected allies in a crusty, aging newspaper reporter and her mother, a once-prominent political mastermind, from whom Cooper has been estranged for years. Along the way, she comes to grips with her past, learns to nurture the relationships she cherishes, and finds out who she can count on, and who she can’t. "Robert Inman's tale delineated rabid ambition, but what I found most fascinating was the slow demise of a marriage between two powerful politicos. Their story was as sad as it was familiar. The more Inman revealed, the more I related to the protagonist, Cooper Lanier. Her biography spoke to me as a late-blooming Baby Boomer, as a woman, as a wife....Inman adds blood and warmth to believable scenes between daughters and mothers and grandmothers; mothers and sons; lovers and marrieds....The Governor's Lady is an excellent read....The political plot line provides forward thrust, but as middle aged folk understand, it is relationships that transform and defeat us. "Inman beautifully blends old-fashioned Southern storytelling with tense political drama. Readers with an interest in American politics, fierce women, or family relationships will enjoy this novel, whose strongly developed characters and plot suspense will keep them from putting this book down until the very last page." "Inman constructs a colorful world of southern politics marked by old-fashioned manners, questionable ethics, and pretentious names, then challenges that world with the installation of a female governor willing to take on the old regime....an intriguing plotline balanced by meaningful and heartfelt introspection on family and ambition brings interest to this tale." "The Governor's Lady...moves at an intoxicating pace. Inman is intimately familiar with the inner workings of the Southern political landscape and he takes this opportunity to examine the role women play in this old boy's club setting....Inman's keen descriptions of his characters make them easy to imagine....Inman's mastery of dialogue and the fast-paced, engaging story line make it well worth the read." "I thoroughly enjoyed Bob Inman's forthcoming Raleigh-set political novel, The Governor's Lady (John Blair $26.95 due in Sept.) Bob was a Charlotte news anchorman for over twenty years and knows the heart and soul of the political landscape in North Carolina. The story: When a popular governor's wife succeeds her husband, he expects her to continue his state policies (via the good ole boy network) as he runs for president, but she has her own agenda, and it's fun to see her come into her own. I look forward to seeing Bob again when he's here this fall to discuss the book (you can preorder it now). 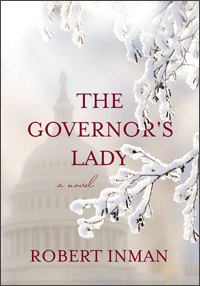 ""Inman's inside look at the family of ambitious politicians makes for great storytelling....The coming together of his experience covering public affairs and his talents as a writer make "The Governor's Lady" a welcome gift for any reader who loves politics." "...a terrific story with a cast of unusual characters." Robert Inman's acclaimed novels Home Fires Burning, Old Dogs and Children, Dairy Queen Days and Captain Saturday are now available in digital format on Amazon Kindle, priced at $3.99, and on loan from Kindle Lending Library. Read reviews at www.goodreads.com, www.barnesandnoble.com, and www.amazon.com. Read summaries and first chapters of all books by clicking on the titles at the top of the page under "Books." Robert Inman's film adaptation of his first novel, Home Fires Burning, is now available on DVD from Netflix. Home Fires Burning originally aired on CBS-TV as a "Hallmark Hall of Fame" presentation -- starring Neil Patrick Harris, Kyle Chandler, Barnard Hughes, Bill Pullman and Sada Thompson. THE GOVERNOR'S LADY available on Amazon Kindle $3.99. Feisty woman Governor battles powerful political forces, including her husband. THE GOVERNOR'S LADY now available on Amazon Kindle. $3.99. Feisty woman Governor battles powerful political forces, including her husband. Autographed copies of Captain Saturday, Dairy Queen Days, and Home Fires Burning available for purchase via PayPal. "In a very real sense, the writer writes in order to teach himself, to understand himself, to satisfy himself; the publishing of his ideas, though it brings gratifications, is a curious anticlimax."